An original letter of correspondence between brothers and business partners Joshua Coffin Chase and Sydney Octavius Chase. 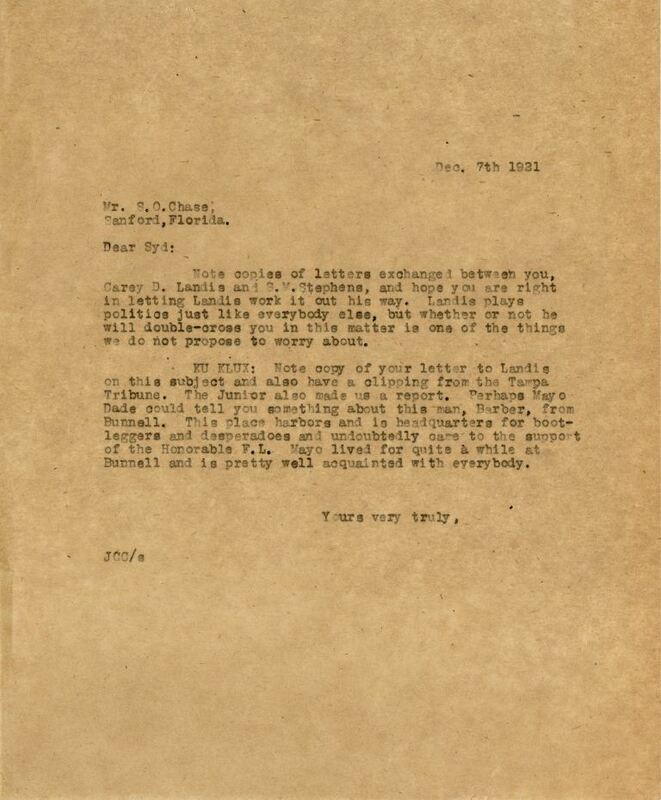 Topics discussed in the letter include copies of letters between Sydney, Cary D. Landis, and S. V. Stephens; a copy of Sydney's letter to Landis regarding the Ku Klux Klan demonstration in Sanford on the eve of an election; and a newspaper clipping from The Tampa Tribune on the KKK. Original letter from Joshua Coffin Chase to Sydney Octavius Chase, December 7, 1921: box 173, folder 2.36, Chase Collection (MS 14), Special and Area Studies Collections, George A. Smathers Libraries, University of Florida, Gainesville, Florida. Digital reproduction of original letter from Joshua Coffin Chase to Sydney Octavius Chase, December 7, 1921. Note copies of letters exchanged between you, Cary D. Landis and S.M. Stephens, and hope you are right in letting Landis work it out his way. Landis plays politics just like everybody else, but whether or not he will double-cross you in this matter is one of the things we do not propose to worry about. KU KLUS: Note copy of your letter to Landis on this subject and also have a clipping from the Tampa Tribune. The Junior also made us a report. Perhaps Mayo Dade could tell you something about this man, Berber, from Bunnell. This place harbors and is headquarters for boot-leggers and desperadoes and undoubtedly came to the support of the Honorable F.L. Mayo lived for quite a while at Bunnell and is pretty well acquainted with everybody. Chase, Joshua Coffin. 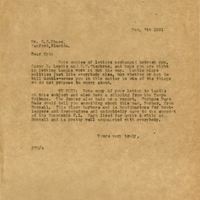 “Letter from Joshua Coffin Chase to Sydney Octavius Chase (December 7, 1921).” RICHES of Central Florida accessed April 19, 2019, https://richesmi.cah.ucf.edu/omeka/items/show/2529.